What is Negligence to a Personal Injury Attorney? One of the most common questions a personal injury attorney gets asked is “what is negligence?” It’s obviously very important when in terms of personal injury cases, determining who was negligent and who wasn’t. However, the word itself leaves quite a bit of room for interpretation. How can one person be proven more negligent than another in terms of a car accident or a slip and fall case? These are the kinds of questions that people wrestle with daily. The LA Injury Group has laid out a simple explainer that can hopefully clear up some questions about negligence. To answer the question “what is negligence,” the law says that there are elements to a negligence claim. All of them must be proven to show that the person at fault (the defendant) acted in a negligent fashion. They are, in no particular order: the legal duty the defendant had to the plaintiff was breached since they acted or failed to act in a particular way. Another is “duty.” Under the circumstances of the event, there was a legal duty that the defendant owed to the plaintiff. Additionally, “causation” is the one that might be the easiest to wrap one’s mind around: through their actions, or inaction the defendant literally caused the plaintiff’s injuries. “Damages,” means that, as a direct result of the defendant’s action, the plaintiff suffered, was injured and harmed. As you might imagine, that can be a high bar to clear. However, the personal injury attorney at the LA Injury Group have years of experience and can prove that the answer to “what is negligence” is “what the defendant did” in your case. The word “duty” can have many meanings when it comes to personal injury law. The first thing people think of when they hear the word “duty” is that someone directly reporting to someone above them – like a cop talking to their commanding officer. While that makes sense in some cases, as in a general practitioner owes any patient of theirs competent medical care, but that’s not the only way the word is used. When asking “what is negligence,” it’s important to keep in mind that the word “duty” has a range of definitions. For example, one of the other ways that “duty” is used in the context of personal injury law is in terms of driving. When you drive a vehicle on the road, you may not realize it in these words, but you do have a “duty” to those around you. That duty is to drive with a certain degree of care. You follow the rules of the road and all applicable laws for yourself and for others. You have a duty to your fellow drivers and pedestrians, and you do everything you can to live up to it. So, when someone violates that duty in a car, they could end up getting someone hurt. It doesn’t mean necessarily that they’re driving under the influence (which is absolutely failing in that duty and also a crime) but it could be as simple as spending too much time looking at their phone while they’re driving. It could be fiddling with the radio too much, it could be ignoring road signs or a million other things that would constitute violating that duty. To go back to the analogy of the car accident, the “reasonably prudent person” would be someone who drove the way they were supposed to, or expected to. So, this would be someone that drives the speed limit, uses their turn signals, doesn’t swerve, obeys the rules of the road, that kind of thing. Should a driver not do that, and in turn, that ends up harming someone, they would fulfill this element of negligence as they breached that duty that they had to that driver. It’s important to keep in mind that you, as a person who was injured in some kind of accident, don’t have to figure this all out for yourself. That’s the job of a personal injury attorney. If you think you might have been injured due to someone else’s negligence, reach out to the LA Injury Group. It’s easy to schedule a free consultation with them. Don’t feel like your case has to match all of these components to prove the other party’s negligence before calling the LA Injury Group. If you even feel they were just a little big negligent, and it lead to your injury, it’s absolutely worth it to contact the LA Injury Group. They have a dedicated investigative team who can find out what really happened to cause you to be injured. You’ll never have to pay unless they win, and the consultation is free. So, really, there’s only upside and no downside to contacting them today. The third step in answering “what is negligence” is causation itself. The negligence of the defendant themselves caused the plaintiff’s injury. The link must be proven, the direct line from A to B. It’s important to keep this mind. The defendant could’ve been doing something very negligent, and yet if it didn’t directly lead to the plaintiff getting hurt, then it’s not going to work. For example, if the defendant was on their phone illegally while driving, but the plaintiff suffered an injury far away, that’s not going to prove causation. This can be one of the more difficult parts of negligence to prove, but again, the LA Injury Group has the kind of experience with these cases to do so. For years, they’ve taken on the insurance companies and all kinds of defendants in the negotiation room as well as in the courtroom. They’ve won some enormous settlements for regular folks that allowed them to get on with their lives. In the wake of an injury, or even worse, a wrongful death, everything in life can be very difficult. By having the LA Injury Group on your side, they can help make things just a little bit easier. “Damages” are considered the fourth part of negligence. They depend on the injuries you’ve suffered. Typically, this consists of the medical expenses, the cost to replace property, lost wages, diminished earning capacity, and so much more. The LA Injury Group has a proven track record of helping folks to get as much compensation as they need. You have people in your life that count on you. You and the ones you care about most deserve to be compensated for your pain and suffering. It’s important to point out that even though the examples in this article were about a car accident, negligence can lead to many other kinds of personal injury cases. “Slip and fall” accidents are a common one. A business owner doesn’t bother to fix their steps, railing, or somewhere else on their business property that consumers and customers could be hurt. Then, the steps, railing or whatever break, causing an injury. The LA Injury Group can help you to get compensation for those injuries, as well. 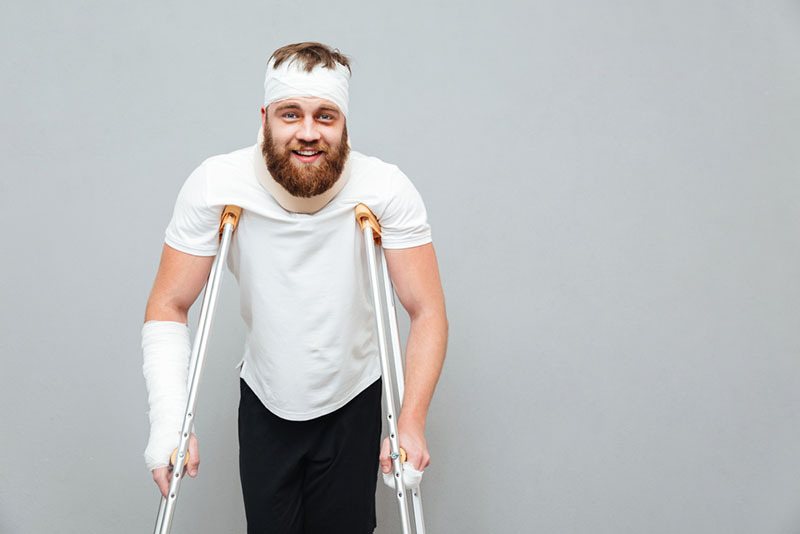 In fact, whether it was an accident or anywhere else, the LA Injury Group can work to get you the compensation you deserve. You can schedule a free consultation whenever you’d like, and someone from the firm will be happy to talk to you. Set that up by calling (818)210-4558 or going to their website.